NB. The official mono LP release of this concert included sections spliced in from rehearsals to replace some sections of the live performance which didn't come up to Toscanini's high standards of approval. The nature of this stereo recording means that we cannot perform the same edits, and thus we present the unexpurgated live concert as performed - fluffs and all! The error is a simple one to make – you see, the NBC tape was not the only recording left from the performance. A second recording was made inside the hall from a second microphone; it has been preserved these past 59 years, and arrived in better shape than the unedited NBC recording. This fact, however, is somewhat secondary to the most crucial, vital point about the second recording: it was made using a second microphone, positioned separately to the NBC's microphone. This means it is, in theory at least, possible to reconstruct a stereophonic recording using the two sources – or at least stereo of a kind. A normal stereo recording, at it's most simple level, is best made using two microphones carefully placed and directed in order to create the most naturalistic stereophonic effect. The two outputs are recorded onto two tracks or channels which run concurrently – in 1951 this would have meant two tracks on one tape, had the technology been available at the time. Because the two tracks are physically side-by-side on a single tape and read by a single head, any fluctuation in tape speed will not cause a divergence in the juxtaposition of the two channels and the stereo image will remain absolutely stable. Next we have two independent recording machines, each with its own minute speed fluctuations, something which will be further exacerbated on replay. Without some kind of time-code locking, no two analogue recorders or replay machines will ever stay perfectly synchronised, so our ideal of two channels on one tape and one replay head is also lost. To add another complication to this already complex picture, one of the two recordings appears to be 'straight', whereas the other has had some kind of 'gain riding' – raising the volume levels of the quieter sections and attenuating the levels of the louder sections. Finally, and unsurprisingly, both have different tonal characteristics (different microphones and recording equipment) and both have emerged in differing states of disrepair some six decades after the event. To attempt to deal with all of these issues would have perhaps been an insurmountable task until very recently indeed. The key technologies which have made the present release possible are only recently developed – and though no doubt further advances might at some day in the future make this kind of work simpler, and possibly produce better results, I think the results here are truly something to marvel at and savour. I try to remain modest here – I have been the mere manipulator of tools I could not hope to construct. Work began on the project in much the same way as I would normally proceed. The recordings were re-pitched to a standard A440 following basic de-clicking. The issues of tonal differences between them become irrelevant during the XR process, as each is re-equalised to a common reference, and then to each other, in order produce as close a tonal match as possible. This is done using high resolution computer analyses of the average frequency responses of each recording across its entirety and using very precise equalisation tools to match the two. Next comes the tricky part – mixing the two halves into a single 'stereo' track. I used an educated guess as to the relative position of the microphones in order to determine which was left and which was right. Then began the painstaking task of lining the two up. Speed fluctuations on each track meant that synchronisation was forever being lost: the two tracks went in and out of tune with each other, one galloped ahead as the other fell behind, and so on. After hundreds of edits and endless re-pitching and fine-tuning of short sections, often corresponding to a handful of notes or a few short seconds of music, some kind of result was achieved. The resulting “stereo” mix was rather wild – voices and instruments lurched from one side to another thanks to the gain-riding applied to one track only. An automated procedure to centre the tracks seemed the best solution here, adjusting the two channels simultaneously in volume to balance out the discrepancies between them. This is inevitably a compromise, but it seems to work. Now began the fine-tuning – thousands of manual corrections to deal with pops, clicks, crackles, slight shifts in synchronisation previously missed and so forth. One particular brass entry, for just two notes, suddenly diverged in pitch – for a moment the glass-like clarity NBC brass section became more like the sound of a drunken Oom-Pah band at the tail-end of a Munich beer festival. Gradually these flaws were addressed and things began to fall together, and I was able to unleash another new 'secret weapon' – the automatic phase corrector. This analyses the two channels and looks for similarities and phase discrepancies between them, constantly adjusting their relative position in order to further fine-tune synchronisation. (A coarser version of the same would have saved me a huge amount of work, but this operates in the realms of milli- and micro-seconds.) The result is a further marriage of the two halves and a highly integrated stereo image – at least for much of the time. Now although an 'accidental stereo' recording such as this cannot match an intentional one, it is clear by switching between the two individual mono channels and the stereo hybrid that a massive leap has been made on behalf of the listener. At its best, and this is true for long sections of the recording, the stereo is remarkably convincing and adds hugely to the experience of the listener. At its lesser moments there is some blurring of the picture, some apparent wandering of the image, but although the fine detail of soundstage is lost, the impact rarely diminishes. One can but hope that the discovery of these two independent recordings of this concert may lead to other similar instances coming to light. In the meantime one can only marvel at the good fortune that such an important concert recording turned out to have a long-hidden partner, ready to be reconstructed into the dramatic and thrilling musical document we present here. My thanks again go out to those who have freely contributed source recordings for this project, who discovered that such a reconstruction was possible, and took the first experimental steps in the realisation of this project. This release is neither in synthetic stereo nor a duplication of RCA’s edition of the performance: To quote Pristine’s insert it is “a stereo reconstruction using two separate mono recordings made by NBC and Carnegie Hall each from differently positioned microphones.” Skepticism was my initial response, but listening proved otherwise. This is genuine stereo that adds significant realism to the sound. 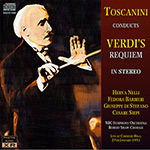 If it lacks the depth and dynamic range typical of today’s best engineering it nonetheless offers considerably more sonically than what RCA’s edition provides, not only in its stereo spread but also in including the passages that Toscanini objected to and insisted on being replaced by rehearsal material before endorsing an “official” release. Those familiar with earlier Toscanini-NBC performances of this work, notably those of 1940 and 1948, may find this one falls short of them. Both are available from Music & Arts. The earlier one offers good sound, but it is not quite so full as that of a Pristine transfer (PACO 038.) I have not heard the Music & Arts transfer of the 1948 concert, which was not broadcast. Musically, this 1951 account does not quite match those earlier performances. But despite the blemishes that Toscanini could not accept, its documentary value is indisputable. For those with a special interest in the conductor it provides the opportunity to hear a celebrated performance as it has never been heard in a recording before. It is certainly a fascinating, often riveting, and, considering its provenance, sonically amazing. None of Ben Grauer’s commentary is included.